Watch our recent appearance on "Good Morning America"
In Dogs We Trust uses positive methods that can be integrated into your daily routine. This is not a sport or competitive training facility, we aim for impressively trained family pets by utilizing a unique program which focuses on impulse control. Class curriculum includes training your dog how to focus on you, control his excitement and respond to the first cue happily! Check out our testimonials page to see what some of our clients have to say about our services. Watch owner and head trainer Melissa Millett on Doggy Diaries on Rogers TV London and Kitchener! Founder and head trainer of In Dogs We Trust, Melissa Millett started training in competitive obedience as a hobby with her own dog in 1998 and immediately developed a lifelong passion with training dogs. 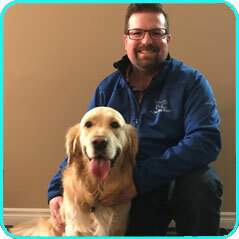 Since then, Melissa has taught thousands of family pets, holds training workshops for professionals in the pet industry including Veterinary technicians, Service Dog Trainers and monthly sessions for the staff and volunteers at the London Humane Society. As an animal expert, Melissa has been featured on every major Canadian TV network as well as internationally. Breakfast Television (Toronto, Vancouver, Calgary), CP24, Global News, CTV (Toronto, Vancouver), Animal Planet, The Pet Network, etc. Host of the popular Television Show "Doggy House Calls" and the spin off series "Doggy Diaries" in London, Kitchener and Ottawa. Founder and performer of the 'Ultimutts' a division of In Dogs We Trust, the stunt dog show boasts dogs (and a trained cat) that can walk tightropes, jump rope, ride scooters, skateboards, walking handstands, and more! A few of the Ultimutts have been featured internationally on; Good Morning America, The Rick Mercer Report, The Family Channel, CBC and Cineplex Theatres. Bella the Boston Terrier has traveled across the country with Ripleys Believe it or Not! to promote her appearance in the 2016 publication. Melissa also trains animals for film and TV with many clients of IDWT receiving phone calls for auditions. Clients of In Dogs We Trust have even found themselves working on set with A-list celebrities like Goldie Hawn and Kurt Russell! All basic classes at IDWT are geared towards having a wonderful and calm family pet as opposed to a sporting dog or obedience competitor. Melissa's interest in extreme trick dogs absolutely helps with family pet training. After all, if she can easily teach a dog to walk a tightrope or skateboard, then teaching your dog to come, stay and walk nicely on a leash is a piece of cake! 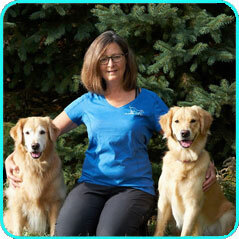 Laura Gifford is a Registered Veterinary Technician that has been a trainer for In Dogs We Trust since 2007. 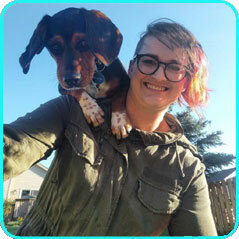 She met Melissa by attending her training classes with her then 3 year old Lab X and her newly adopted Cattledog X. Always having a strong interest in dog training and dog behaviour she was overjoyed when Melissa invited her to assist in some classes which quickly became a regular pass time. Laura enjoys training her 3 dogs Lilly, Kaz and their newest edition George who helps assist her in the classes that she teaches. Laura, along with her dog Lilly, is also a member of the Ultimutts Stunt Dog show that Melissa founded in 2010. Laura has a particular interest in dog behaviour, obedience, tricks and has been featured on the television show "Doggy House Calls". Known to many as the mystical Wizard Of Oz, the never seen, yet ever present brains behind the emails, and registrations is Mary. Not a Professional Dog Trainer, she has added her cheerful disposition to the front line, first contact person at In Dogs We Trust. Mary brought her hamster sized Bichon puppy Lacie to us for training in 2009 and has never left. She and Lacie were part of the original Ultimutts, appearing at many fairs, and festivals as well as television spots on Breakfast Television, The Rick Mercer Report, CP24, and Doggy House Calls. Lacie is part of the cast of the popular kids show on CBC, Ruby Skye PI The Maltese Puppy. True acting is when a Bichon plays the role of a Maltese. Email Mary at info@indogswetrust.ca for class information, registration, booking appointments for private lessons, and walk and train packages. Ron is our newest trainer and obtained his PhD in Microbiology & Immunology. Currently he works as a research scientist who investigates how drug-resistant bacteria make people sick. When he’s not in the lab he loves spending time with his Golden Retriever named Winston who loves people and pets alike, and looks forward to meeting you! Ron met Melissa after enrolling Winston in training classes at In Dogs We Trust. After attending many training sessions from basic puppy classes to tricks and advanced obedience, he was thrilled when Melissa approached him about joining her team of trainers. Having dogs all his life and enjoying seeing each of them reach their full potential Ron jumped at the chance to be a part of In Dogs Wes Trust to hone his skills as trainer. After hours of apprenticing and learning from Melissa and her team of trainers, Ron and Winston are eager to assist you. Lori's love of dogs began 40 years ago when her mother adopted a beautiful little red female Golden Retriever. Lori and her sister would never agree to the pageant life so mom entered the dog in a conformation show where structure and movement were judged against breed standard. They were instantly hooked! Basic manners led to more formal obedience and more dog shows. Lori has received many high in class awards and a few perfect scores trailing. She still shares her home with Golden Retrievers and competes in Conformation, Obedience, Rally Obedience, Agility and Scent Detection. Despite a love for competition, Lori understands the wants and needs of the average family and focuses on a high level of obedience for the family pet. She can be found teaching Puppy, Basic, Intermediate, Advanced and Agility. 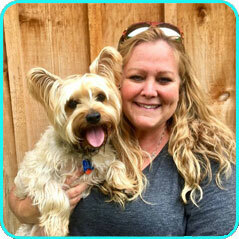 Nicole has her PhD in Applied Behaviour Analysis and is proponent of positive reinforcement for both dogs and people. Currently, she works as an assistant professor at the University of Western Ontario researching behavioural interventions for people with developmental disabilities. She brings Baegel, her rescue beagle, with her to work every day! 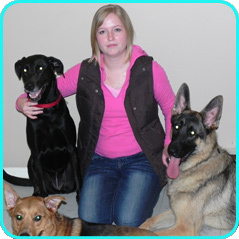 Nicole began working as a trainer at In Dogs We trust after taking a number of classes there and is eager to share science-based approaches to training with you. In her spare time, she and Baegel volunteer with Muttley Crew, giving trick shows at community agencies around London. JJ met Melissa in 2014 when she needed help with her reactive 1 year old Silky Terrier pup Jax. Both Jax and JJ learned so much that they decided to continue into tricks and studying Canine Body language to help understand emotions in dogs. Jax thoroughly enjoyed the tricks class so they continued in a couple more courses until they eventually joined Melissa's "Muttley Crew Therapeutic Trick Dogs" to visit seniors homes and other events in the London area for trick shows. JJ's love of dog training has really grown and she completed a 1 year apprenticeship with Melissa to study the skills needed to teach Puppy, Basic, Intermediate and Tricks Classes. JJ also shares her home with an almost 17 year old black cat named Fonzie... who is full of his own tricks! Register early to be sure that there is a space!